France, Belgium and Holland are all preparing for new protests by the movements of the ‘gilets jaunes’ (yellow vests) today, both in their respective capitals and other major cities. 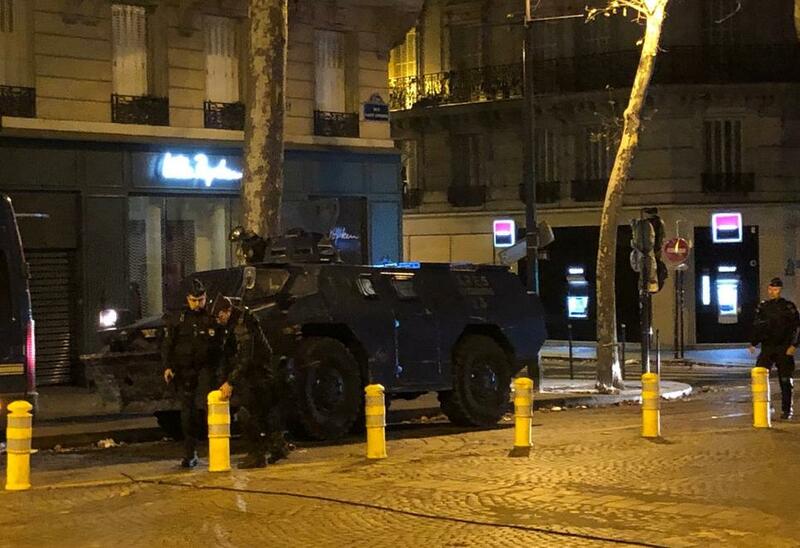 In Paris the measures being taken to prevent further violence are nothing short of extreme as army vehicles can be seen near the Arc De Triomphe already (pictured). In several cities, the 'Gele Hesjes', the Dutch version of the French protest movement Les Gilets Jaunes, will be protesting on Saturday. Concerned citizens have announced that they will take to the streets in Amsterdam, Rotterdam, Maastricht, Groningen and The Hague, among others. Related coverage: France - Country Ready To Explode Over Shock Police Brutality To Students (Video). The yellow vest movement has not resulted in any grand scale rioting like it did in Belgium or France so far. Also today, most Dutch people expect the movement to simply consist of people walking in group around the capital Amsterdam (and other cities) voicing their discontent. Belgium has seen widespread rioting and fights with police officers. Just last week, 2 police vehicles were burned and protesters threw rocks and building material to police forces as they tried to get near the offices of the European Commission. Police is in the capital Brussels with a large force and several shops have closed in anticipation of possible new violence. France, and certainly Paris, braces itself for new protests. Around 8,000 security forces are deployed in Paris and tourist attractions such as the Eiffel Tower and the Louvre remain closed. Not yet 8.30am, and 177 suspected troublemakers have been arrested in Paris under suspicion of carrying offensive weapons as #GiletsJaunes rally for an “Act 4” demonstration against President Emmanuel Macron’s administration. Sounds like "Lock 'em up" is police order of day. The French capital changed into a battlefield again last Saturday when protesters clashed with the police. Demonstrators also set vehicles on fire and plundered stores. Even the famous Arc de Triomphe had to pay for it. The government has announced that it will use 89,000 troops nationwide this time to suppress possible riots. Related coverage: France - Can Macron Save His Presidency?. The 'gilets jaunes' (yellow vests) have been protesting for weeks against the policy of the French government that would undermine their purchasing power. The immediate cause was a tax increase on petrol and diesel. This measure had to lead to a cleaner environment. The government of President Emmanuel Macron has since clawed back, but the protesters have now said they will continue until the politicians announce their ‘démission,’ aka that they admit the need for urgent and new elections. Let's hope the (metaphorical) flames burn even higher. It seems Media and Tree Huggers want to avoid the other possible points behind these Protests, and possible climate temperature cycle variations. 1a. The media in general is omitting the fact the obvious that a MAJORITY of the population is NOT buying into the false narrative of a Fossil Fuel created Climate Change. 1b. The lie that a National (a country vs the world) TAX will fix any possible GLOBAL problem. 2a. No one wants to seriously explore the FACT that the human population itself and the supporting food (Meat & Veggies) supplies have increased many 100's of times to feed it. 2b. Each of these produce more BTU' heat and claimed problems and issues than fossil fuels. 3a. The use of Air Conditioners has increased 2000+% since 1950's. Each of these remove heat and place it back into the environment. 3b. So start counting houses and buildings and multiply that number by their sq/ft size and thats how many BTUs are being squeezed back into the now smaller environment. So maybe the real threat is the Human Population? Maybe we need to kill off a few billion humans. Or maybe start adding birth control to water and food supplies. BTW: We have not read about large scale any LOOTING yet. THE WORLD POPULATION COULD FIT INTO THE STATE OF TEXAS. CLIMATE CHANGE IS CAUSED BY THE POLE SHIFT NOT HUMAN BEINGS OR THE USE OF FOSSIL FUELS, FOR GOD SAKE! ITS ALL A SCAM TO RAKE THE DOUGH TO FEED THEIR WARS OF BULSHIT AND FILL THEIR OWN COFFERS. DEATH TO GLOBALISM!!! VIVA LA FRANCE AND NATIONALISM!!!!!!!!!!!!!!!!!!!!!!!!!! !